Watch the video above or here. I’ve heard about crustaceans crawling out of their own shells but I’ve never seen a spider crab with long legs yank itself out with such ease. It sure makes my crab eating skills an embarrassment. How cool would it be if you could just pull out all the meat all at once skipping the hammer and crackers! Watch the video above and starting around 0:55 it gets mighty fascinating! The talk our buddy Dan Ariely gave at Poptech2009 is finally up. Watch it here, and be sure to pick up Dans books Predictably Irrational or his new book The Upside of Irrationality. 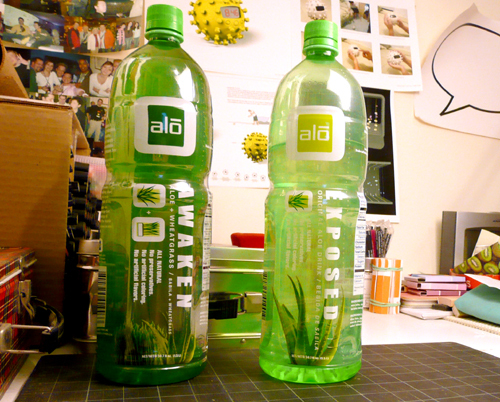 It’s been awhile since I last posted about a new beverage but this week I came upon a refreshing drink called Alo which infuses aloe bites along with an assortment of other flavors giving water a nice simple zest. I think I’ve had something like his in Hong Kong before. I first had the aloe with wheat grass mix called Awaken and just picked up the original aloe version called Exposed, but they have quite a few new assortments of flavors on their website which I have yet to come by at a store. Anyhow, go give Alo a try… these bottles cost me about $5 each so hopefully it’ll be available in bulk to customers for a better price soon…. otherwise Alo is DELICIOUS! Fast lane please! A great shout out to Volkswagen for another great project! David Byrne (RISD drop out alumn) talks about how architecture helped music evolve. I relate this a lot to how your deskspace both digital and physical affect your creative work. Following an old but still fun trend in pixelating products in our world is turning digital icons into products. This is probably one of my favorites but I really can’t wait until our entire physical world is represented by 2d objects… graphics and products at their best… at least visually. I’ve seen some pretty creative proposals (ie, the designers proposal), but when the person proposing is in the film/entertainment world, this is what you get! How awesome. Watch the entertainment proposal above or here. You are currently browsing the weblog archives for June, 2010.